A range of timeless and authentic recipies, lovingly created over 25 years. 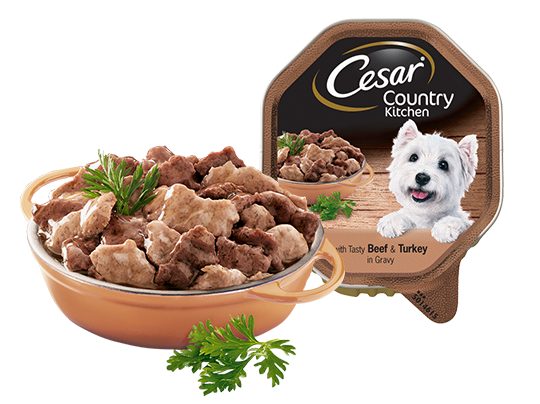 CESAR Country Kitchen Dog Tray with Beef and Turkey in Gravy 150g is rated5.0 out of5 by1. Rated 5 out of5 byAnonymous fromDeliciousIt's so tasty me and my dog enjoy these together, But she doesn't eat her peas! A range of rustic and hearty dishes with a lovingly homemade feel. Seasoned with herbs and a delicious sauce, they will turn his mealtimes into moments of joy for him… and for you. And because all CESAR® recipes are healthy and 100% complete, your dog can enjoy them as often as you like.